Srini feels that a strong Indian presence at this year’s edition of the world’s premier automotive beauty contest is the beginning of something very exciting. Back in 2004 – on Friday, May 28, to be precise – I drove a magnificent 1935 Rolls-Royce Phantom II Continental with flawless Streamline Coupe bodywork by Gurney Nutting. The memories of that drive are still fresh: the locomotive push of the inline-six, the Spirit of Ecstasy leading the way like an outrider, the constant steering corrections to stay in a straight line and the reflection of the lights of the Mumbai-Pune Expressway tunnels hypnotically dripping off like pearls from the curvy fenders. Little did I know then that, in end-August 2018, the world would see this very car parked on the lush green 18th Fairway of the Pebble Beach Golf Links in the Monterey Peninsula of California. 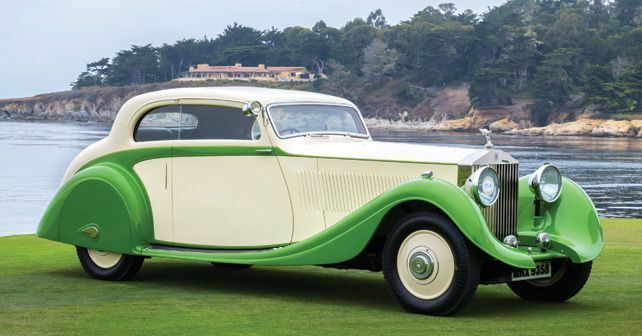 The Rolls-Royce was making its presence at the world’s most famous and prestigious event for vintage and classic cars, the Pebble Beach Concours d’Elegance. That too, how! It would go on to win top honours in the Motor Cars of the Raj category and was also given a trophy for the best Rolls-Royce at the show. It has also been immortalised in the Pebble Beach 2018 catalogue and posters, painted by renowned automotive artist Tim Layzell. Interestingly, the Rolls wasn’t the only car at this year’s Pebble Beach that I had driven – a one-off Fiat 501 S Corsa dating back to 1921 that once belonged to the Maharaja of Patiala is another. The Fiat was modelled after a Fiat Grand Prix car of 1920, and to shift gears you had to insert your hand through the four-spoke steering wheel. Imagine doing this while you’re cornering at high speeds on rubber-band tyres. These two absolutely unique automobiles were part of a staggering 11 cars from India that participated in the world’s most famous event for vintage and classic cars. There were five cars from Mumbai, three from Delhi, two from Rajasthan and one from Indore. All of them are beautiful examples of automotive engineering, the coachbuilder’s art and a reflection of India’s incredible and distinctive automotive legacy. They are also representative of the huge passion of their Indian owners, as well as the talents and skills of their restorers. Which the world is now waking up to. About time too, I would say. While you will read a report on this year’s Pebble elsewhere in this issue, it’s important to understand the significance of a big Indian contingent at the world’s premier heritage car event. Participants at Pebble are the who’s who of the vintage and classic car world, with virtually limitless budgets and access to the finest of restoration houses. The levels of maintenance and upkeep are so superior that it is wryly said, the cars are not merely restored, they are Pebbled. Besides the levels of restoration, the provenance of cars that participate at Pebble Beach are immaculate – history and originality get plenty of points. When only the finest, rarest and exceptional cars make it to Pebble, you can understand that our Indian cars were in elite company. The international recognition for India’s valuable automotive heritage has taken its time coming. While most people of the global vintage and classic car community know that there are some ‘old’ cars in India, the significance and the provenance are what make their jaws drop. When they hear of the same car being in the same family for generations, plus the quirks, eccentricities and idiosyncrasies of their original owners and other ‘barn find’ stories, it only adds an exotic touch to Indian cars. These stories add an intangible value to Indian heritage automobiles that many cars in the West simply cannot boast of. The biggest benefit is that this international recognition encourages owners to maintain and invest in their cars, while restorers will get an impetus to acquire skills they didn’t have earlier. It can give us an eye for detail and an uncompromising focus towards quality that still eludes us. If our heritage car community readies itself for the challenge, India could even be the destination where owners from other countries send their cars to for world-class restoration abilities. The spotlight focused upon us exactly ten years ago, with the first edition of the Cartier Concours d’Elegance in Mumbai. Since then, the movement has grown stronger with more and more awareness being generated of Indian cars. It’s like the world has discovered an entire subcontinent filled with unique pieces of automotive art – especially pre-WWII – and realised that there are plenty more where they came from. There’s more to be done. For now however, congratulations are in order and we might as well bask in the spotlight till the next big event. Also read - Act now!